Thinking about solar but not ready to take the plunge? 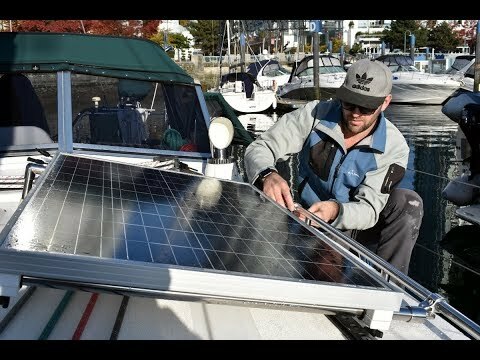 There are some great solutions that allow you to try solar on your boat without re-sewing your canvas with zippers, drilling holes for mounting or gluing anything together. There are a number of boaters who want the benefits of solar but aren’t quite ready to permanently install a solar panel on their boat. 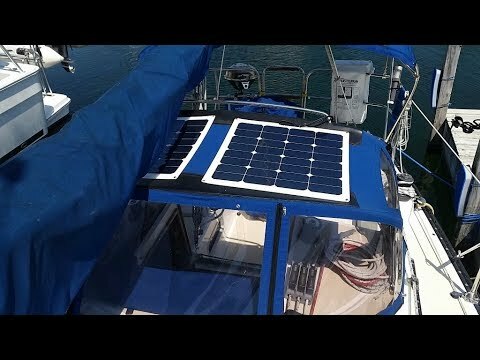 Bayliner 34 Temporary Solar. Our first boater has a 34 foot sunbridge with a house-bank consisting of 6 flooded golf cart batteries for a total of 660 Amp-hours at 12 VDC. The main draw is an older fridge with a small freezer in the galley and a new 110/12V Engel freezer on the back deck. On any given day, the total draw including the stereo, TV, laptop, LED lights and hot water heater, runs about 130 amp-hours per day. Our client spends much of her boating time at anchor or at an outstation with no power which meant running the generator after 2 to 3 days. The bow of the boat was originally designed for a sun bed, which is long gone, but there is more than enough space for a solar panel and since the connectors were still there for the sun bed, it was easy to install grommets on the solar panel and Velcro it through the rings. Considering the space available, a Gioco 100 watt panel fit nicely. On a sunny summer day, a 100 watt panel will provide approximately 25 amp-hours of energy output per day. This daily output offsets about half of the daily power required to run the refrigerator. When installing a solar panel, you need to install a solar controller so that solar panel recharges the battery at the right voltage. For instance some panels output 18-22 VDC, connecting those directly to a battery would overcharge and damage the battery. With this 100 watt panel we installed a Genasun GV-10 MPPT controller. When choosing a MPPT controller make sure you choose a MPPT controller that is highly efficient so that most of the solar energy goes to the battery and is not lost in the controller. The positive and negative leads from the solar panel connect to the MPPT controller and in turn the controller connects to the battery positive and negative. Remember to always install a fuse on any positive lead connected to a battery. Hide Cabling in the Anchor Locker. In many boats, of this design, there is a top deck fitting that is used with a manual anchor locker. In this case, it was not being used and was a perfect place to enter the solar cable into the boat. 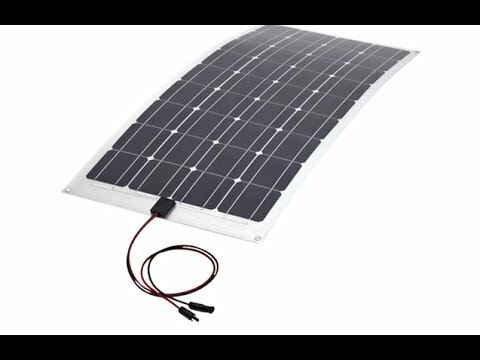 The solar panel comes with two MC4 connectors which allow you to easily disconnect the solar wiring from the panel and remove the panel when it is not in use or for storage. From here, the wire pair dropped through the top deck, along the front stateroom sidewalls, through the galley and back to the controller which was installed on the inside wall of the engine room. From the MPPT controller, the positive wire connected to the battery bus un-switched positive distribution with a fuse. The negative wire from the controller was connected to negative bus. If you have a battery monitor, make sure the negative cable from the controller does not bypass the shunt, otherwise you will not be able to see the amps coming in on your battery monitor. Consider the length of the wire run and the expected output of the solar panel, we used 10 gauge wire for the whole cable run to minimize the voltage drop. The boat travels at 20 knots so the panel is only used at anchor or at the outstation when there is not too much wind forecasted. In this case, it is very easy to remove the panel to store below, or under a mattress, and slide the wires back into the locker. She has been using the panel for the last three months and is happy to report that at peak sunshine, the panel is producing 4.7 amps and she can spend more time at anchor without running the generator to charge the batteries. The only challenge is that she has to run the generator for hot water. 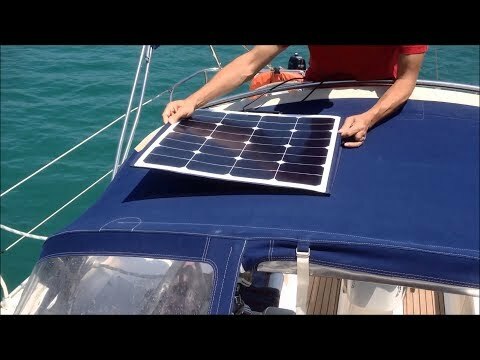 10 Metre Sailboat with an All-in-One Solar Panel. 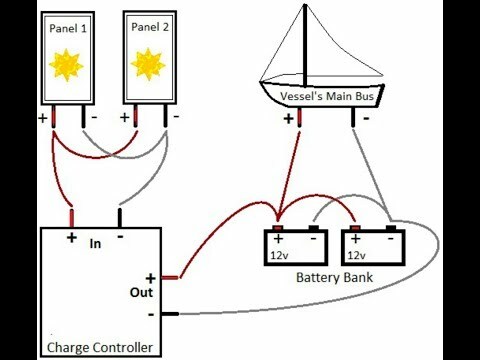 Our second client has a 10 metre sailboat with a house bank of 2 AGM group 31 batteries for a total of 230 Amp-hours. The total draw, including a small fridge, LED lights and a coffee maker runs about 75 amp-hours per day. Some owners prefer the simplicity of having a controller already built into the solar panel. Of course, this simplicity in installation comes at a cost. A solar panel with a built-in controller is about double the cost of buying the panel and controller separately. For this client, we recommended the 47 watt Solbian all-in-one rectangular panel as the shape is very long and narrow and he chose to install them on the dodger using bungie cords. 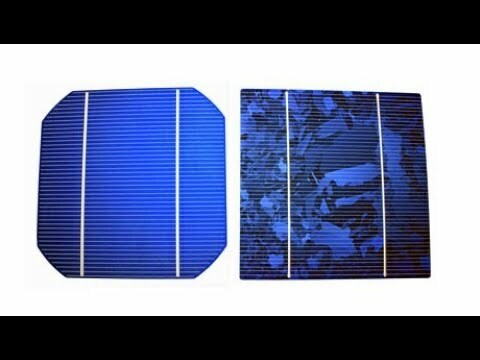 These 47 watt all-in-one panels will produce about 12 Amp-hours per day. With two panels installed, the client was able to benefit from 24 amp-hours a day of energy from solar. Thereby extending his time at anchorage by another day. Installation Tips. Another way to install solar panels is to use the YKK SNAD adhesive backed domed stud fasteners which allow you to attach a solar panel to canvas or decking without damaging the surface. There are no specials tools and, better yet, no holes in your boat when installing those pads. Any canvas shop can easily install snaps on the edges of your solar panel. The snap, installed on solar panel, secures to the boat using a pad of 3M acrylic foam adhesive tape that is tough enough for the marine environment. The pad mounted on the boat, will not snag clothing or deteriorate from the sun and are dome shaped so you can step on them without hurting your foot. 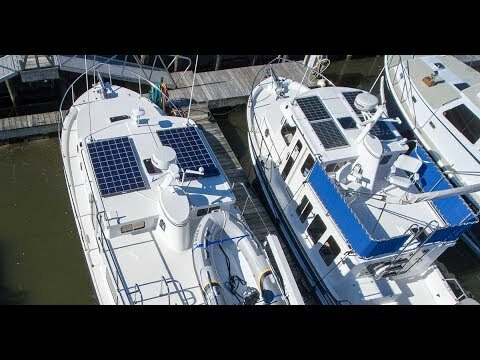 If you have been contemplating solar, there are numerous options now available in the marine industry that allow you to start small. A solar array does not have to be designed to meet all of your energy requirements. In both of these examples, the boaters just wanted to offset the refrigeration and spend one or two additional mornings without the generator noise or having to running an engine at idle at anchorage.